More Finny – my books. my life. Sorry for going dark for so long. I’ll be back with some reviews later this week. I hope everyone had a wonderful Thanksgiving. Now that it’s time to start your holiday shopping, I wanted to drop in to share with you a wonderful deal on one of my favorite books of 2010. 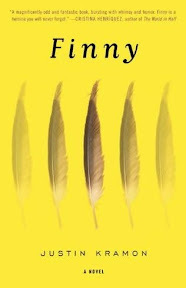 You can get a signed, personalized copy of Justin Kramon’s book, Finny, for $17 (US only). You can read my (gushing) review of Finny here. Now, how many people can I buy this for this Christmas? I’m reading it now and I am really enjoying it. Aw, I loved Finny! I’m going to send that link to my mother. I never know what to want for Christmas but books, but at least a signed copy would be something different!